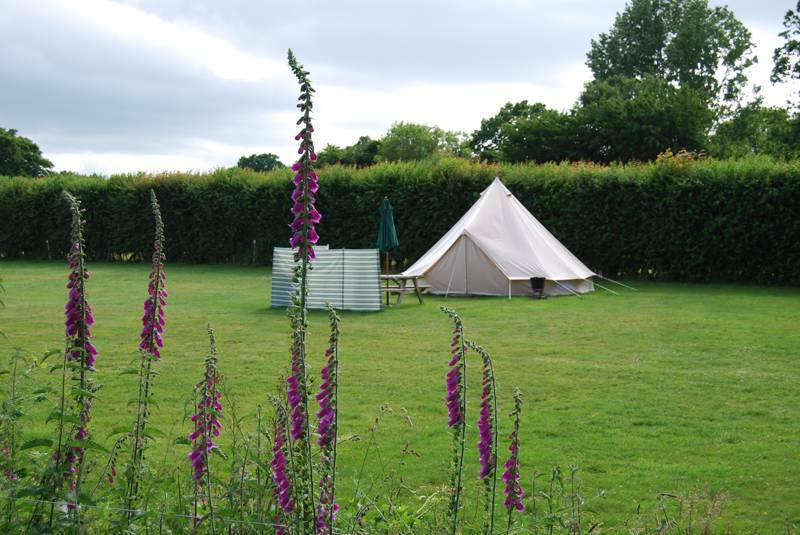 ​A spacious, undesignated pitch on one of Hare & Hounds 2 grassy fields. 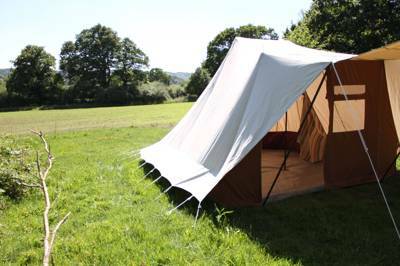 Suitable for Tents and Small camper vans only. Lovely cosy hut if you prefer a little more luxury! It has everything you need including a kitchenette, log burner and ensuite WC/Shower. Why not go camping without having to set a tent up? All you will need to bring is towels and your clothes! A small town atop a sandstone promontory that was once a strategic port, Rye has retained its charming cobbled streets and higgledy-piggledy houses to now look like a piece of old England pickled in a jar. Just two miles to its north, The Hare & Hounds has a strangely similar vibe. The red tiled roof and old, strutted windows look across Rye Road to a stretch of orchards, while a tiny thatched cottage is almost hidden behind its own greening garden hedge. A blackboard sign beyond the cottage door reads simply, ‘please drive in for free range eggs’, though you half expect a lady on horseback to gallop down the drive with a basket of them swinging under her arm. It’s the view from the back windows that we’re interested in though. 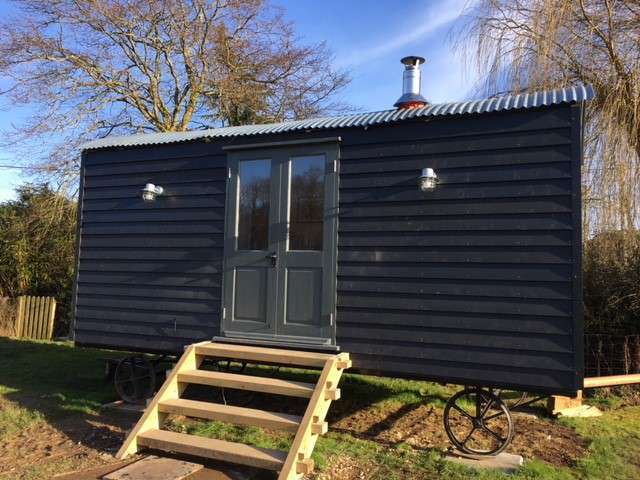 Behind the old pub – sadly they recently called last orders and it’s now been converted into a tasteful B&B – two simple grassy fields offer camping for tenting folk looking for a laid-back place to pitch. If you still fancy a pint, though, it’s an easy walk down the road to The Oak or you can head back to the bustling lanes of Rye, close enough to reach by bike. The campsite itself has a wonderfully honest feel. There’s no one marching round with a rule book or designating pitches and the place exudes and incredibly informal atmosphere, yet everything operates with an air of mutual politeness – kids playing ball games in the ample space without getting on anyone’s nerves. The washing, toilet and shower facilities are all brand new, bringing and oddly modern contrast to this obviously historic area, and a policy of limiting the pitches to just 30 in the two and half acre field means you’ll never get your guy ropes tangled with the neighbour. 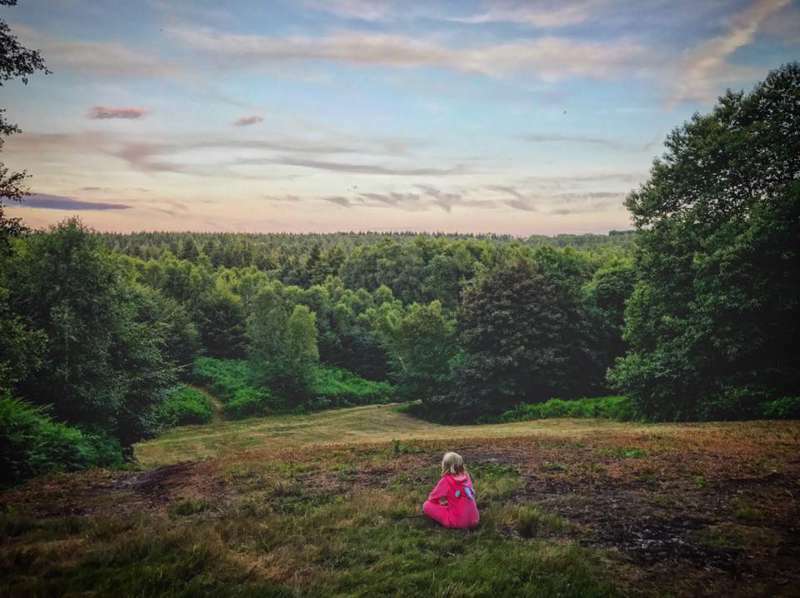 Beyond the picture perfect townscapes you can escape the summer crowds by heading into the surrounding countryside – within the High Weald AONB, there’s plenty of top walking to be had, with particularly good local routes following along the banks of the River Rother. Or head down to the beaches of the south coast to dabble in the sea and build sand castle replicas of Bodiam Castle, a perfectly formed, moated keep just 10 miles from the campsite. For latest availability and best prices for Hare & Hounds Campsite, please use the Date Search above. Finally found a campsite that adheres to the “quiet time” which is so reassuring with little ones. Little touches like the fridge freezer, microwave and charging point makes a huge difference. We had a great mon-fri stay and could have happily stayed longer. We stayed mon-fri in the week before the August BH. Again, found the site lovely and peaceful which is great. A nice mix of happy kids and friendly pets. Everyone respected the no noise after 10pm which was great for putting LOs to bed so we could enjoy a bottle of wine by the campfire! (Chapel Down vineyard is a short drive from the campsite). Again, Ben and Harriet could not have been more helpful, going above and beyond their role of host when we ran out of stove fuel. Thanks so much for another great holiday. Harriet and Ben have created a haven! We spent five nights at their campsite. Every night we had a campfire. We bought essentials from their little shop and we enjoyed the peace and quiet after 10 each evening when the children had gone to bed and the adults sat around chilling. The children enjoyed the communal football and the space. The pitches are well arranged around the fields leaving space for games and fun in the middle. The facilities were kept clean and were really well organised. Thank you so much for all your hard work, Harriet and Ben. In a summer that has seen very little rain we arrived on Friday afternoon to a tropical rain storm. Ben and Harriet were hard at work to ensure that the site didn't flood. Harriet had had a close eye on the weather and said it would clear by 7pm and was helpful in recommending a good and friendly pub a mile up the road. We returned after 7pm to pitch our tent. Ben came around with fire pit and wood. Facilities are great and Ben and Harriet friendly and very helpful. Highly recommend this campsite. Nice small campsite with friendly hosts. Close to Folkestone tunnel and the great Camber beach! Great location, great facilities, lovely and peaceful. We stayed 2 nights at the end of July and had a lovely stay. Ben met us on arrival and was friendly and helpful. We were able to hire a brazier and fire kit which he brought over to us immediately. The facilities were very good - 2 unisex toilets, 2 unisex showers, 1 female toilet and shower, 1 male toilet and shower. Despite the site being almost full, we never had to wait for any of them and they were in good order at all times. The site has a shared fridge freezer which was very helpful for storing little bits like butter during your stay, a microwave and a covered washing up station. The tiny retro caravan shop is gorgeous. The site is a great location for doing so many things. During this stay we visited Bedgebury Pinetum where our 6 yr old enjoyed the Julia Donaldson themed walks and play trails. The Go Ape there is the best one we’ve done. We also visited Rye and had a special lunch at The George in the lovely covered courtyard. It serves some beautiful shellfish and seafood dishes. On lovely weather days it fills up early, so aim to get there by 12pm. We visited the Camber beach every day for a swim and adventures in the dunes with the dog. It is fantastic to find a beautiful stretch of beach during the summer holidays that is dog-friendly and also has an area watched by lifeguards for swimming. Park in the council car park opposite The Gallivant Hotel, then walk over the big dune to the beach. The side to the right of the letter C sign is dogs allowed. If you have a NT pass you are spoiled for choice. Lamb House in Rye, previous home to Henry James and later by the wonderful EF Benson is open to view Fri-Mon during peak summer. It was also used in the BBC adaptation of Mapp and Lucia a few years ago as was much of Rye. We also visited Sissinghurst Castle which has beautiful grounds, a first rate vegetable garden, and a good dog-friendly mile-long walk around the castle and mini lake, although dogs cannot go in the actual castle or formal garden. A great mini break with a lot packed in. Superb location, excellent facilities and warm helpful owners. Hare & Hounds is a well thought through and managed campsite.The location is a superb jumping-off point for touring the East Sussex region. We had easy multiple day trips to Dungeness, the wonderful Camber Sands and historic Rye town itself. As a site Hare & Hounds has excellent facilities. 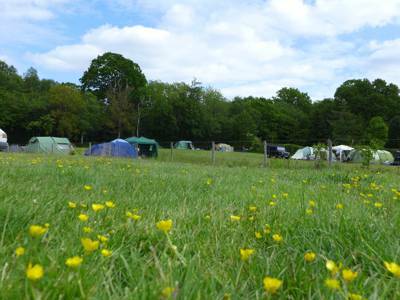 From the well-spaced camping pitches, through to the very well maintained shower, toilet, dish-washing, fridge / freezer guest food storage facilities, to the daily orderable supplies of kindling & logs for the hirable braziers. Additionally, there's even a 'corner shop in a caravan' (the Hound Shop) providing sweets, pastries, hot drinks and other nick-knacks that make camping a little easier and definitely a fun and safe on-site destination for children. We stayed over four nights / five days during the recent July heat wave. There were two families and three children aged 5-11 years plus our 3 year old family Cockerpoo in our 'double-pitch compound.' We had a seamlessly fun time. The children mixed and played with other children from across the site in plain sight of all the parents in a centrally located goal mouth set-up. They had plenty of independence and opportunity to spread their wings safely. The rural location was a delight, as were the sounds of nocturnal wildlife and nearby farm animals each day. I even spotted a circling Hawk one afternoon - magnificent! Star-filled skies were a bonus due to the lack of light pollution. Sitting around the brazier at night was deeply relaxing and a stimulus to great conversations at days end. Communication with the owners was simple and cordial. It was also easy to strike-up relaxed conversations with fellow campers (British & international) without a sense of pressure. I happily recommend Hare & Hounds to friends and campers looking for a relaxed, well organized and maintained site. If you want a simple, convenient, relaxing and clean base for your explorations of East Sussex, Hare & Hounds would be hard to beat. Nice campsite with super friendly owners. First time in a Bell Tent and fair to say everyone enjoyed the experience. BBQ’s and off the ground camp fires welcome which is an added bonus. Would stay again. Easy access, nice, open set up, good scale, friendly atmosphere, decent facilities, great location, nice views, even the weather behaves itself! An good campsite, which has plenty of space and allows campfires. An easy cycle distance to Rye and onto the marshes. A great campsite for families with kids. Four stars instead of five, when full or nearly full the facilities are stretched. lovely, friendly campsite. great location. 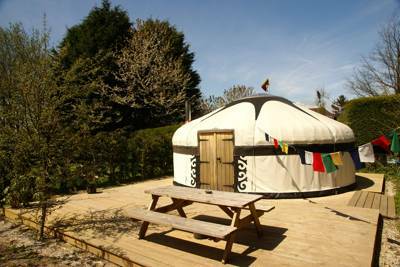 We booked the Hare and Hounds campsite as it seemed the ideal location to escape the capital and relax near the coast. We were greeted on arrival by the friendly owners who were only too pleased to show us around and allow us to pick our spot. The campsite composes of two fields with each plot within easy walking distance to the facilities. The showers were nice and clean and well equipped, there is a large area for washing up plus a fridge, freezer, microwave and charging points. We walked to Rye along the footpath which didn't take too long and the beach at Camber is beautifully sandy. We loved it! We stayed for a week in August 2015, with 3 other families, and had a wonderful time. Ben and Harriet were great hosts, nothing was too much trouble, facilities were new, clean and tidy and being able to have a fire each night was an added extra. You're ideally located for the beach, Rye and various Country pubs , can't wait to book again! Harriet and Ben are really lovely. We booked for two nights camping plus one night in the B&B, but as the weather was awful last week opted to stay in the dog-friendly B&B room for two nights instead. Harriet was really helpful with making last minute changes. (She also does a totally awesome breakfast!). The recommended pub down the road does lovely food & great beers. In Rye, the "Edith's House" cafe is lovely, and the Standard Inn does a cracking lunch - get a window seat and watch people pass by the Tudor house on the other side of the road. What a lovely place - peaceful, green and set in beautiful countryside, it has great facilities and even when full never felt too crowded. The owners were incredibly helpful, and renting a fire-pit was brilliant as well. Perfect place, and will definitely come back! Free advice to carless travellers - book the taxi to and from the site a good day in advance. We managed, but Rye isn't exactly swimming in taxi companies! We took our two boys (aged four and two) to the Hare & Hounds for their first camping experience and it was the ideal choice. The field is small enough to let the kids run around without worrying about them disappearing and the spaces between pitches big enough to not have to constantly chase and catch them before they disturb other guests. The facilities are modern and clean and there are a number of nice touches, such as washing-up liquid and bowls being provided and the wood and burners than can be hired and wheeled to your tent so you can enjoy a warm (and safe) camp fire. Nearby Camber Sands is a stunning beach (albeit with expensive car parking) and we will definitely return to the Hare & Hounds. It's a shame you can't get a pint now the pub has closed but there are plenty of other places withing walking distance to quench that thirst. We spent a delightful couple of nights on the south facing slopes of the Hare & Hounds campsite. After a brisk morning spent at nearby Camber Sands we were greeted by a fire pit hand delivered by the only form of transport necessary in cute surroundings - a wheelbarrow. The facilities are all brand new and owners very accommodating with the kind on 'lean on a gate post' charm perfectly in tune with the gently rolling slopes. Fresh seafood (scallops & prawns) can be bought straight from the boat in Rye for an unforgetable barbecue feast. Chilled, family campsite that has recently been refurbished. The owners have great knowledge of the local area, pointing us to a local fish shop when we purchased some prawns which we cooked on the fire. Space for the kids to run free in the day and a fire pit for roasting marshmallows on in the evening. Showers and bathrooms were always clean. Really recommend this delightful campsite! 2 fields with 28 tent pitches, none with electrical hook ups and 2 furnished Bell tent (min 2 night stay) and a fully equipped shepherds Hut. A couple of campervan pitches also availble. 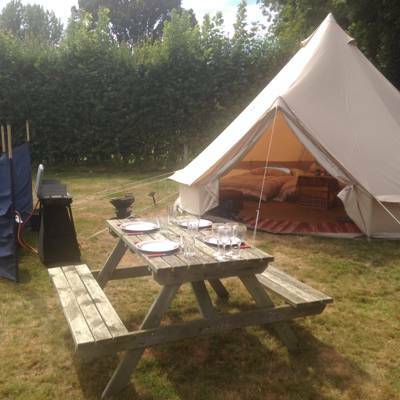 Tents, glampers, couples, families and well-behaved dogs – yes. Caravans, camper vans, big groups, young groups – no. 4 hot showers, 4 toilets, washing up facilities and a large car park that keeps the camping fields themselves car free. 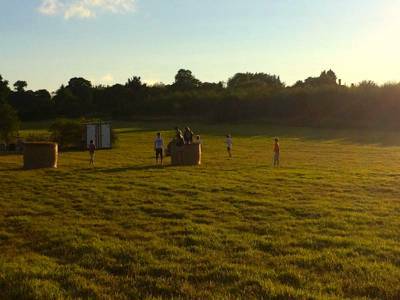 Fire baskets and fire wood are available for hire and there's loads of room to play in the field (ball games e.t.c. allowed). Campfires must be in off the ground braziers and BBQs must be raised too. Amid the High Weald AONB (01580 879500), there are plenty of good walks to be found but the campsite is perhaps best placed for enjoying Rye and the famous 1066 area. Hastings is worth the journey, not only for its historic old town, but also for the spattering of fantastic seafood to enjoy. Further inland, Battle, is the place where William the Conqueror actually defeated Kind Harold II and the spectacular Abbey (01424 775705) he built in commemoration has a brilliant visitor centre. Head a few miles south of the campsite to the numerous beaches within driving distance, Camber Sands being the most well known and offering loads of watersports – kite-surfing becoming particularly popular. The 14th-century Bodiam Castle (01580 830196) is a few miles north of the campsite, while Scotney Castle (01892 893820) and Bateman's (01435 882302), Rudyard Kipling's former home, are further but still just half an hour away. It's an easy 5 minute stroll to The Oak pub and The Bell is a short drive/cycle away in Iden. For more choice, of course, Rye is just 2 miles away and has plenty of top restaurants such as The Ship (01797 222233), The Runcible Spoon (01797 229409) and Ypres Castle Inn (01797 223248). Fish and chips are also pretty essential! The nearest supermarket is a few minutes drive and there's a local farm shop just down the road that has a fantastic selection of fresh local produce. The Hare & Hounds is situated on the A268 between Peasmarsh and Rye. Post code is TN31 7ST. Note sat Nav will take you to Lea Farm which is opposite the site. From London direction: follow the A21 towards Hastings, at Flimwell turn left at the lights and follow the road through Hawkhurst and Sandhurst. Then take a right as you come into Northiam signposted for Rye. After going through Peasmarsh you will come to Rye Foreign. The campsite is on the left, shortly after The Oak Pub. From Hastings and Ashford follow the signs for Rye and when you get to Rye follow the signs for Peasmarsh travelling on the A268. As you come into Rye Foreign the campsite is about a mile on the Right. There is a bus stop (labelled Lea Farm) directly outside the site that runs around once an hour. Trains from Ashford and Hastings run regularly to Rye and you can get a bus or taxi from the station straight to the campsite. If you are a keen walker then there is a public right of way/footpath from Rye (around 45 minutes) to the site.